Can America Recover from Its Economic and Spiritual Challenges in Time? The United States stands as the wealthiest, most powerful nation on the face of the earth. But now, in the midst of unprecedented and skyrocketing federal debt, severe economic troubles, political uncertainty, declining morality, a weak church, growing spiritual apathy and apostasy, historic natural disasters, and myriad other daunting challenges, many wonder if America’s best days are behind her. &#10031;Will history’s greatest democracy stage a miraculous comeback, returning to the forefront of the world’s economic and spiritual stage? &#10031;Can America’s remarkable religious heritage be renewed today with another Great Awakening? &#10031;Or will the rise of China, Russia, radical Islam, and other external threats — coupled with the U.S.’s severe internal struggles — send her into a death spiral from which there can be no return? 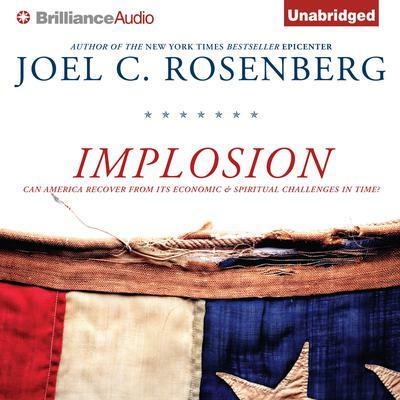 New York Times bestselling author and political expert Joel C. Rosenberg tackles the question: Is America an empire in decline, or a nation poised for a historic renaissance? Implosion will help you understand, through the lens of Scripture, the enormous economic, social, and spiritual challenges facing the United States in the twenty-first century and explain how you can make a difference at this critical crossroads in our history.